Alexander Robertson, the famous "Poet-Chief"
The following account is taken from a manuscript memoir, dated 1834, in possession of the Strowan family, and was reproduced here by permission of Major Hamish Robert. lexander Robertson, the famous "Poet-Chief" of Clan Donnachaidh, was born about the year 1670. His father was first married to a sister of Sir James Drummond of Machany, by whom he had a son Robert, his heir. Alexander was bred to the Church, and studied under the charge of John Menzies, Regent of the University of St. Andrews. From infancy he was trained in the political opinions of his family, who since the first breaking out of the great civil wars in the time of Charles the first were devoted loyalists. Menzies, to whom his education was entrusted, was himself a zealous Cavalier, and confirmed by his authority and approbation the hereditary sentiments of his pupil, whose youthful mind thus received a bias which influenced his conduct and opinions through life. His father, who died in 1688, was survived by his elder son Robert only for a few months. The succession then devolved upon Alexander. He was at the time only about nineteen years of age, but notwithstanding his youth King James II in the beginning of May 1689, granted him a Commission to levy a regiment of Foot for his service. Strowan accepted the Commission, immediately left the College of St Andrews, raised a battalion of his Clan, and joined Lord Dundee. He was taken prisoner in September 1689, and carried to the Castle of Blair Athol, where General MacKay was encamped with his army. In a few days he was removed to Perth, in which place the Earl of Argyll commanded, and from there he was afterwards carried to Edinburgh. Both Argyll and General MacKay treated him with much kindness, invited him to their own tables, while other prisoners of distinction were neglected, and otherwise showed him the most marked attentions. While he remained in Perth the Earl laid no restraint upon his person; and finally he procured him his liberty. It seemed to have been the object of General MacKay and the Earl of Argyll, by these artful courtesies, to make a proselyte of their young prisoner to Whig principles and the party of King William. But it is fair to add that Strowan himself ascribed Argyll's conduct to a more generous motive. In a Note to one of his Poems he says: "When the Earl of Argyll fell into his misfortunes and the Clans and the adjacent shires were ordered by the Privy Council then in being to rise in arms to destroy him, all took arms except the present Laird of Strowan's father, who obtained leave to stay at home to protect the country from theft and depredations. In return of which mark of humanity the first Duke of Argyll got the present Alexander Robertson of Strowan set at liberty on his Parole out of the Tolbooth of Edinburgh in the year 1689, and exchanged as a prisoner of war for Sir Robert Pollock of that ilk, who was prisoner in the Isle of Mull, with an allowance to Strowan to join his misfortunate master wherever he be found; in which service he has continued, without being guilty of treachery to any government whatever." "This day the shippes are to set saile. The skipper ordered us to goe out of the Town against one of the Clock which we are resolved to doe - but it being in the day time I cannot venture to come and see you; so I wish you all health and happiness - adieu". “For God's sake, let this bill (for 1,000 marks) be answered for I have exhausted myself of money maintaining my comerades. My master gives me as he gives to anie of my station, but consider he has many servants, and that he has no money of his own". "Let me know what is become of my Ladie Dundee. If she is in Edinburgh, doe see her, and tell her that the K and Q almost adore her. Adieu." “I doubt not but you have heard of the misfortune that has befallen a squadrone of the French fleet, which is the cause that the King is not in England, and we in Scotland, before now. But, however, it is not so great but that ere a month, they will be at sea a greater fleet than ever. The King of France is resolved to set his Majesty on the throne before the end of the summer. Let none of you be discouraged, for you will see your lawful prince ere long happylie established upon his royall throne". "The King of France will take Namure in a few days General Cannan kisses your Ladyship's hands, and your daughter's, and drinks your healths every day". "The Queen is brought to bed of a daughter. We would have wished rather to have had a Duke of York; but, however, it will stop the mouths of vypers, who belied her as not able to bear children. The king is in good health, and the prince is beginning to know himselfe to be a great man. He is in effect the Queen's picture". "As you love me, dispatch this affair, for my reputation is at stake. Let James Mason write me the state of my affaires as I know his hand. Upon my honour I am starving in this place." "I should be glad to know upon what terms I may come home, for I am resolved to do nothing dishonourable for the family I am sprung of - you know as well as I they have been always loyall". "Upon the word of a gentleman, which is all I can say for your satisfaction. I am resolved to goe for England, whether I get a pass or not, and to venture my neck for the preservation of that family, which you venerate so highly. I have been here above four months, and have had but 200 guilders in a dear country where I and my servant can not live under four guilders a day; so you may guess what I owe. Mr John Gordon has been my only friend; and nothing but generosity obliged him to it, and I would rather die than he should be a loser." Soon after this, he came to Scotland, and Queen Anne gave him an ample remission of his attainder and a grant of his estate; but, the remission and grant never having been passed through the seals, the forfeiture of 1690 still remained in force. He entered into his estate, and soon rendered himself exceedingly popular, particularly among his own Clan and tenants, to whom he ever was an indulgent master. He entered deeply into the intrigues for the restoration of the exiled Royal family, and strongly opposed the Union with England in 1707. "I am just going off with a guard - God knows if ever we meet; if not, I am afraid whoever succeeds to me will not be altogether so easy to your Ladyship as I have been. I must own I have met with afflictions enough to breake any thing of a generous spirit, and I have strove to weather and conceal my misfortunes, which, in spite of me, have had influence upon my humour, so as to sour it and render me very uneasy". From this period down to 1714 his exertions on behalf of the Royal Family continued unabated. He was in constant communication with the leading men of the Jacobite party and gathered round him, and trained to arms, many who were glad to be enrolled followers of a powerful and popular leader. But what rendered him most obnoxious, if not most dangerous, to the opposite party, were his political writings. These poetical squibs and diatribes, which are now almost forgotten, obtained the most unbounded popularity among the Scottish Jacobites of the period. What perhaps enhanced their value, was the difficulty of procuring them, for owing to the high political seasoning they contained they could not safely be published. It is certain that his poetical talents made Strowan's name familiar among his contemporaries, and the use he made of them joined to his consideration as a Chief at the head of a devoted and numerous Clan, and his activity as a politician, rendered him as valuable to the Jacobites, as he was dangerous to the Whigs. It may be interesting to the reader to notice some circumstances in the private life of Strowan which shew the great power of the Highland Chiefs at that period. Mrs Margaret Robertson, his sister, was secured in a certain sum out of the family estate; but the laird found it inconvenient to make regular payment of this provision. Mrs Margaret having been advised to have recourse to legal measures, actually took out a warrant for apprehending his person. The officer employed to put the writ in execution was accompanied to Rannoch by fifty men, under the command of Stewart of Tulloch, and by Mrs Margaret in person. They were informed by the servants at his residence of Mount Alexander, that Strowan was living at his mother's jointure-house of Carey, eight miles farther up the country, and they proceeded there accordingly, leaving Mrs Margaret at the village of Kinloch Rannoch, situated half-way between Carey and the Mount. Upon arriving at Carie, they perceived the laird with his red cloak and hat, and carrying a gold headed cane, walking in a stately manner, alone, on the lawn before the house. The party, happy at the prospect of accomplishing their duty so easily, instantly rushed upon him, but alas, when they laid hands on this imposing figure they found under the red cloak and hat not the laird of Strowan, but a bare-legged ghillie. Meantime, the laird, who had been very nearly surprised, hastened through the wood behind the house to Loch Rannoch, accompanied by the twelve men who were always about his person, took boat, and rowed directly to the village of Kinloch, where Mrs Margaret waited for the messenger and his party. He instantly apprehended the unfortunate lady and carried her to a small island, where she was put under confinement. Strowan, conceiving her delinquency to be of a very aggravated and obnoxious nature, at once injurious to his dignity and subversive of his authority, resolved that it should meet with a severe punishment. Accordingly, he despatched his sister in the custody of a party of men to Sir Donald Macdonald of Sleat, with a request that she should be confined in some place, whence she could neither escape nor communicate with her relations. Sir Donald, willing to oblige his friend in such a reasonable matter, at once and cheerfully agreed, and sent the disconsolate Mrs Margaret to a remote island in the Atlantic, where she lay effectually confined. Her mother, and her powerful connexions, the Lords Portmore and Forrester, and also the Duke of Atholl, sought redress from the laws of the country; but Strowan set the law, and the instruments of the law, at defiance, and Mrs Margaret continued in durance until her own courage and ingenuity set her free, after a confinement of upwards of fifteen months. She escaped in 1715, and was proceeding incognito through Atholl, on her way to her mother's house at Perth, when she was detected by a party of her brother's followers and carried by his orders to Dundee, then in possession of the Highlanders, and confined in the gaol of that town. The jailer and others of the townsmen who were examined respecting the event made oath that a party of Strowan Robertson's Highlanders arrived in Dundee on a certain day specified, carrying with them a lady whom they imprisoned in the Tolbooth, and that she remained there for some time in confinement. That Mrs Margaret was finally set at liberty by the Earl of Mar in 1715, is confirmed by a facetious letter addressed by the Earl to Strowan on the 30th October 1715, which, after making merry with several light as well as serious subjects, concluded thus: "Your dear sister is at Dundee, but I was forced to promise to your mother, that she should be kept there but eight days, which are near expired. Good Sir, I am yours, etc". It is curious to find a person like Strowan who was a man of the world, a gentleman and a scholar, engaged in such a transaction - but we must not measure his conduct by a modern standard, nor forget that the Constitution vested very considerable powers in the Barons at that period, and that the Highland Chiefs were despotic and uncontrolled by the law, and their jurisdiction cheerfully acquiesced in by their own people. On the 6th September 1715, the day on which the Earl of Mar erected the Royal Standard at Kirkmichael, he wrote to Strowan, urging him in the most pressing terms to join immediately with such of his followers as were prepared, be the number ever so small, leaving the rest to follow with all possible despatch. Strowan joined the Earl on Monday morning, the 19th, with 300 men. Mar despatched him on the 21st to Perth, to reinforce Col. Hay, then in possession of that town, and gave him instructions to send a hundred of his men in the direction of Castle Campbell, to clear the country of the enemy, cut off their parties, and confine them to their garrison. The duty thus entrusted to Strowan he was well qualified to perform, from his intimate knowledge of the country and he continued to discharge it with activity and success. In the end of October he surprised and took the garrison in the Castle of Weem, belonging to the Whig family of Menzies of Weem, secured the persons of several of the Whig gentlemen in that district, and procured plentiful provisions for the Highland Army. It is proper to notice that his correspondence with Lord Mar shews that all such provisions were paid for in ready money. Mar, in a letter dated 30th October, notes Strowan's Brigade, consisting of from 400 to 500 men, as the strongest in the army. On the 1st November Mar writes him to send up his prisoners to be confined in strict confinement in return for the barbarous usages which the gentlemen taken by the enemy near Dunfermline met with. "As for that fool of a minister", he continues, "who is prisoner with you, if he'll promise not to pray and preach against the King and us, nor to own George as King in public, you are to set him at liberty". He concludes by an order to open two rooms and chests in the House of Weem which Strowan from motives of delicacy had not touched, as they contained the family papers and plate. Mar enjoins that nothing be embezzled. Strowan joined the Highland Army a short time before the Battle of Sheriffmuir, and at that action was engaged on the left wing, and having charged too far was at one time in the hands of the enemy. But his clan having missed him charged back to the spot where he was left, just as he surrendered himself to a party of Dragoons, and was in the act of giving away his purse to a trooper. The soldiers, on observing his men return, asked each other, "Who are these?" and immediately a cry arose among them, "Away, away - it is heather, by God!" The trooper who had so very nearly got Strowan's purse, turned on his heel and called out "Your purse by right is mine". "Yes it is", said the laird, pray come back for it", but the fellow shook his head, and ran off. It may be mentioned, as illustrative of Strowan's Quixotic notions of honour, that he enquired out this man's name, and afterwards sent the purse containing sixty guineas to him at Carlisle. Soon after this indecisive conflict, Strowan retired to his own territory with the greater part of his followers. The Earl of Mar's Letters addressed to him at this time, shew his Lordship's great exertions to conciliate the Highlanders and keep them together until the arrival of the King. He prays Strowan to join him with all the men he could muster and communicated with the Duke of Argyll, who had given out that Strowan was liberated in 1690 on his parole of honour, and obtained from him an acknowledgement that the parole extended no farther than to the procuring the liberty of Sir Robert Pollock, in exchange for Strowan's own, which condition had been faithfully fulfilled. Mar also altered the order which he had formerly given to the Laird of Rora to levy the MacGregors of Rannoch, in prejudice to Strowan's right over that people. He requested Strowan to use his influence with the Highland gentlemen to exert themselves and to send round the fiery cross among their followers; represented the prospects of the Jacobites in the favourable light; talked constantly of the expected arrival of the Chevalier, and of the descent of Ormond on England, and, long after the surrender of the loyalists at Preston, gave out that their expedition was successful. And think on what he's doing. Strowan marched to Perth with his followers in the beginning of December, and remained with the Chevalier until his departure on the 4th February 1716. Lord Mar counselled him to accompany the King and himself which he declined on account of sickness. He made a proposal to hold out the Castle of Weem for the King, but the project was discouraged. The Earl wrote to him on the day of embarkation a letter in vindication of his own conduct, which possesses a degree of melancholy interest. He says: "I thank you for telling me what some think strange, of nothing of designes being dropt to them. I was afraid I had erred on the other side And been too communicative which I am sorry I was till the King came, and now I am to obey orders which I endeavour to do and serve His Majesty the best I can, but I do not know anything I have done yet for which I want an exculpation. I wish His Majesty had a General more capable to serve him than I, which I hope he will have soon. It was the first favour I asked of him to give the command to some other who had some knowledge of these matters, and how soon he gets anybody who he thinks fit for it I assure you I will renew my request. During my having this honor I endeavoured all I could to please every body, but it seems I have not been so happy to succeed in this. Their next General, I hope, will please them better, which they shall have as soon as I can, but when they do, it shall not make me give over doing all the service to my King and country that lies in my power, whatever quality or station I be in". Strowan was taken prisoner soon after this. A party of soldiers who were conveying him to the Castle of Edinburgh halted for the night at Amulree. His sister, the ill-used Mrs Margaret, or as he himself always called her, Black Margaret, arrived there soon after under a fictitious name. She went into the rom where the soldiers sat, congratulated them upon the good service they had done in apprehending the arch traitor Strowan, charged them to take good care that he should not escape, and distributed money among them, telling them at the same time that she had ordered the landlord to supply them with liquor. As she had anticipated, all the men got drunk, and her brother found no difficulty in effecting his escape. In the morning when the prisoner was missed Mrs Margaret gave the men a severe reprimand for their negligence, but she was shrewdly suspected of the plot notwithstanding this pretence of zeal for the Hanoverian interest, though she was never called to account for it. Strowan escaped to Holland in the summer of 1716. 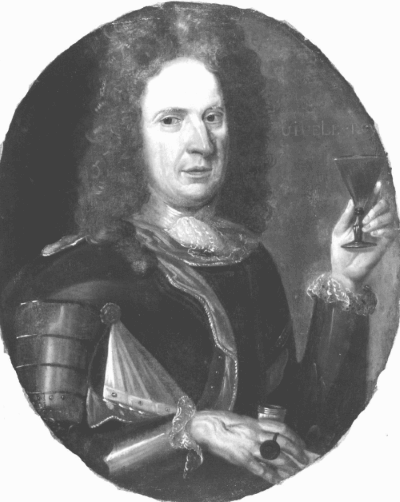 Ker of Kersland states, in his Memoirs, that when he was passing through Rotterdam in 1716 to the Court of George I at Hanover, the Laird of Strowan, "a considerable man among the Highlanders and a man of excellent sense and truly every way a complete gentleman" was deputed by the rest of the Jacobite gentlemen "as a leading man" to make proposals for purchasing back their forfeited estates. Ker entertained the project favourably, and condemns the Government for not yielding attention to it. The unfortunate Jacobites were left in distress and poverty and depending for their subsistence upon the precarious allowance made to them by the Chevalier, and the stolen remittances of their friends in Britain. There is preserved among the papers of the family of Strowan a series of letters from the Earl of Mar and Col. John Hay, afterwards created Earl of Inverness by the Chevalier, to Strowan, from the year 1716 to the year 1726, when he returned home a second time. These letters are curious, as shewing the distress to which very considerable men among the unfortunate Jacobites were reduced as well as the poverty of the Chevalier himself, who, as Lord Inverness writes, had not "ten days' bread to put upon his table without being obliged to butchers and bakers for credit". They also throw considerable light on the intrigues at the exiled Court, and the characters of the most distinguished among its followers. The Earl by the King's command invited Strowan to the exiled Court in Italy, cautioning him against hinting this to any of the other gentlemen, in case of creating jealousy and discontent among them; but it does not appear that he ever went. He lived occasionally at Orleans, under the assumed name of Gilchrist, and at other times in Paris; and, during the whole period of his exile, he continued on very friendly terms with the Earls of Mar and Inverness, who both seemed to hold his character and talents in high estimation. It was at this time that he wrote the most serious and best of his poems. Meantime Mrs Margaret exerted her own activity and influence, and that of her family and connexions, particularly the Lords Portmore and Forrester, for the restoration of her brother's estate. She went to London and threw herself at the feet of George I, and though her suit was at first denied, yet she never resigned her pursuit of it, until by her importunity she forced the King into compliance. It is said that she besieged His Majesty so closely, and threw herself in his way with such persevering obstinacy, that he at last exclaimed in a transport of impatience, "For God's sake, give that woman back her lands and let me have peace". The Estate was restored in 1723 to Mrs Margaret, during her own life, and to her brother's heirs male in fee, but his own life-rent was specially excluded. Nevertheless, Strowan returned home in 1726, and immediately entered into full possession of his inheritance, although he did not get a remission of his attainder until 1731. In the interval he held his lands simply by the sword, and here it is curious to observe that there are still extant a series of letters written about this period to Strowan by his agent, a highly respectable gentleman of his own Clan, in regard to the laird obtaining a pardon or remission of his attainder, and that in almost every one of them there is a hint to send a fat buck, or a dozen brace of Moorfowl or of Capercailzie, and so forth, in a quiet way, to the Lord Advocate and Solicitor-General. It would be malicious to suppose that those learned functionaries could be influenced by such considerations in conniving at the possession of his estate by an attainted person. A more honourable and more probable motive is to be found in their wish not to disturb the precarious peace of the Highlands, or to harass an unfortunate gentleman, who had already suffered severely for his political principles. However that may be, the venison and Capercailzies (the last, by the way, that we read of as existing in a state of nature in this country), somehow or other found their way from the moors and forests of Rannoch to the houses of these official personages in Edinburgh. There is a tradition in Rannoch that Strowan's pardon was sent to him through General Wade, a gentleman for whom, notwithstanding his politics, he had great value and with whom, though they had not then met, he corresponded in regard to the military roads and bridges constructed under Wade's charge. The General appointed Strowan to meet him in Badenoch on a certain day to receive the pardon, but as the laird was journeying northward for that purpose he chanced to meet a number of his friends at the Inn of Dalnacardoch, where he entertained them according to his custom. The jovial party forgot General Wade, the pardon, and everything connected with it, for a full week, and at the end of that period Strowan proceeded on his journey. The General asked him how he could trifle with his safety in a matter of such importance. "Because", returned he with his characteristic politeness, "I felt assured that the pardon was as safe in General Wade's keeping as in mine." From this time forward General Wade and Strowan were on very friendly terms. The General frequently urged him to make an unqualified submission to King George, and to take the oath to his Government; and on one occasion, when Strowan was complaining to him of the annoyance he received from Mrs Margaret's creditors, Wade said, "If you will accompany me to London, and allow me to present you at Court, I will engage that all your troubles shall be at an end, simply upon your kissing the King's hand." Strowan's well known answer cannot be repeated here; but it is needless to say that it was a decided negative to the General's proposition. Mrs Margaret, who died in 1727, had contracted some debt when in possession of the estate, for which her creditors sued Strowan; and as he was under forfeiture at the time, and had not received a remission of the sentence of attainder passed against him, he was incapable of making appearance in a Court of law to defend himself, so that Decreets went out against him as a matter of course. Yet this was but of small inconvenience to the laird, as he found no difficulty whatever in defending himself by his own vassals and clansmen against the emissaries of the law. The Court of Session, upon the application of Margaret's creditors, sequestrated a part of the Barony of Strowan, and empowered certain persons to levy the rents for their behalf. The agents entered upon their task but found themselves invariably forestalled by Strowan, and the tenants were always prepared to shew his receipts for the rents demanded of them. The tenants, however, were upon several occasions obliged to make a double payment, and in order to protect them against such exactions the Chief ordered all the Factors, Commissioners, Messengers and Officers of the law to be driven out of his bounds. Upon this, a writ was issued for apprehending him, and a Messenger-at-Arms, with a Sheriff's posse of about thirty men, proceeded to Rannoch to put the warrant in execution. The party was met by some of Strowan's men upon the Banks of the River Tummel, a few miles below his seat of Mount Alexander. Their papers and arms were taken from them, and they themselves beaten, bruised and maltreated, and finally thrown into the deep and rapid Tummel "to the danger of their lives and great hurt and prejudice of their persons", as is set forth in the Messenger's Execution of Deforcement. The Messenger states that Strowan caused his papers to be returned to him at Perth, but that he, "the said Strowan Robertson, kept the aforesaid arms, illegally and masterfully taken off the persons of the Complainer and his assistants, as said is". Another Messenger and party, who went afterwards to serve an Indictment upon Strowan and his Tenants for this breach of the peace, met with no better success than their predecessors, for they in their turn were used with the same violence and stripped of their arms and papers. Every attempt of Margaret's Creditors to obtain possession of the sequestrated portion of the Barony was baffled, and ultimately no person could be found to act on their behalf. At last, James Robertson of Blairfettie, himself one of the creditors, and, as a Highlander, somewhat better qualified to contend against these masterful courses, took upon him the hazardous office of Factor; but we soon find him complaining to the Court that Strowan with a strong party of armed followers proceeded to collect the rents, turn out tenants, let farms, and to exercise every other act of proprietory in defiance of their Lordships' commission. "He disdains", says the Petitioner, "to submit to the laws, and opposes all law and authority." The Complainer farther states that no Messenger would venture into Strowan's country, unless he was attended by a military force; and that the factor himself lived in great hazard of his life. In these circumstances, application was made to General Guest, Commander-in Chief in Scotland, for the assistance of regular troops to control the Laird of Strowan; and in this application the Lord Lieutenant of the County and the Solicitor-General joined. General Guest, however, declined to interfere unless he had the authority of the heads of the Courts of Session and Justiciary; and hence poor Blairfetty's Petition. It does not appear that he ever obtained quiet possession, and what is worse, Donald Robertson of Woodsheal, a cousin of Blairfetty, thought it incumbent upon him to challenge the unfortunate factor to single combat for the affront he had put upon his chief by accepting the obnoxious trust. They fought with broadswords, and as Strowan himself writes to Woodsheal's brother, the grandfather of the present General Robertson of Strowan, "Blairfetty was sent home a cripple". In 1745 Strowan was himself too old and infirm to take an active share in the campaign under Prince Charles; but he sent a party of his clan under Woodsheal, and another party followed Robertson of Drumachuine, his heir male, with whom he unfortunately lived on bad terms. The Robertsons did not muster so strongly upon this occasion as in 1715, when Strowan himself was in the prime and vigour of his age, and marched at their head. He went as far as Dalnacardoch, to meet the Prince on his way south. When he was presented, he said: "Sir, I devoted my youth to the service of your grandfather, and my manhood to that of your father, and now I am come to devote my old age to your Royal Highness". Charles, well acquainted with his history, folded the old man in his arms, and wept. He accompanied the Highland Army to Edinburgh, but his infirmities had increased to such a degree, that he was obliged to return home after the Battle of Prestonpans, leaving his clan under the charge of Woodsheal and Drumachuine. He travelled from Edinburgh to Rannoch in General Cope's carriage, which had been captured by his clansmen at Prestonpans, and this vehicle was preserved at Carie, until within the last forty years, when it was broken down by some of the tenants on the Strowan Estate, and burnt for fuel. It is said that no overt act of treason could be proved on this occasion against Strowan, and therefore that he was allowed to retain possession of his estate, but as he had publicly joined the Highland Army the forbearance of the Government may rather be attributed to the good offices of General Wade and other friends, and to his extreme old age, which would not allow him to give further disturbance to the Government. The Laird of Blairfettie having been engaged in the Rebellion was incapacitated from further interference in Strowan's matters, so that, for the brief period of life that remained to him, the old gentleman enjoyed peace and quietness. He died at Carie on April 28th, 1749, in the 81st year of his age.